Mountaineering and climbing takes many forms and, as a result, many travel insurers are pretty wary of it - exclusions can apply on all sorts of climbing activities from a simple wall at Center Parcs to a high altitude climb in the Himalayas - but there are a growing number of insurers who are prepared to insure climbing or mountaineering - at whatever level of cover you are looking for. As with any insurance it's important that you make sure you are covered for the type of trip you are undertaking but, from a cost perspective, it's also worthwhile making sure you are not 'overbuying cover' - there is no point being covered for a high altitude climb in the Himalayas if in fact you are undertaking a Via Ferrata break in the Dolomites. So do read all the terms and conditions carefully. Likewise, if you climb once a year, a single trip policy may be a better option for covering your climbing trip rather than an all-encompassing annual policy. We have split our policies into three main categories - those that cover recreational climbing, Via Ferrata, Wall Climbing and the like, those covering European trips (with guides and/or ropes) and those which will cover high altitude Himalayan trips. Remember the companies who cover more 'extreme' activities often offer a range for those looking for lower levels of cover. 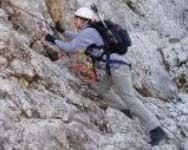 Automatically covers hiking up to 2500m in altitude within their standard activities (although there are limitations on personal accident and liability cover). Abseiling and hiking to 6000m can be taken out as optional extras. Can cover mountaineering (with ropes and guides) to any height limit worldwide (except Nepal which is limited to 4000m) if you select the appropriate group cover. All except Nepal will be covered by a policy including group 7. They also offer an Activity TopUp which means that this can be combined with a 'normal' annual travel policies (such as those packaged with a bank account) for the specific period of the activity being undertaken enabling medical, accident and search and rescue to be covered by Sportscover Direct during that period, but your existing policy to cover the rest of your holiday, your baggage, cancellation etc. Offers a range of 5 policies, from those for people not planning to climb at all, through trekking and moderate rock climbing and Alpine / Ski policies to full blown High Altitude and Remote Area policies. Membership of the BMC is required, although quotations can be obtained prior to any commitment being made. The company have long expertise in this area and the wide cover provided provides customers with confidence. A variety of policies are offered covering climbs up to 7000m, although sports climbers, high altitude trekkers and ramblers can find lower cost policies with more appropriate cover as well.